I had more sense than to challenge the core reforms of the new law, but I did write a nice little piece on one of the goofier aspects of it, the prohibition against giving cards to those under 21. I gather I am in the minority in thinking this is goofy. Of course, cards (credit, debit, and charge) are one of the few topics about which I am content to admit that I am not merely out of step with the rest of the country, I am actually clueless. Every month the wife and I charge stuff. Lots of stuff. Then I send the card company a check (yes, an actual paper one in an envelope) for the amount that we charged. This has been going on for 20+ years now. Apparently, this experience is unique to us. I first admitted being mystified about how Americans use plastic in September, when I discovered that debit transactions now outnumber credit ones. Four months later and I am still scratching my head on that one. A little while after that I took up the cause of plastic over cash. Even an old guy like me who hoards incandescent bulbs and cannot imagine why he should ever be on FaceBook can see that paper money and coins don’t have a future. My confusion mounted earlier this month when I realized that not only do people prefer not to have the option of borrowing, i.e. credit, but Amex has a new card and ad campaign based on the premise that they will actually pay more for a card that is less flexible and forces you to pay in full each month. In November, I had owned up to even more befuddlement when I found out that Real Americans write "check ID" where their signatures are supposed to go on the back of their cards. Huh? I find store clerks that ask for ID to be one of the more infuriating recent retail developments. People actually request this treatment? Really? Seriously, I don’t get it. To be fair, I further revealed my ignorance in that post by stating that I thought that stores were not allowed by Visa/MC to ask for ID. A commenter enlightened me on this. They are allowed to ask for ID, they are merely not allowed to do anything about it if you refuse. This clarification did not decrease my confusion by as much as you might think. Of course, this brings us to the magic fairy land of identity theft, where goblins attempt to learn the secret true names of the good creatures of the realm in order to cast evil spells upon them. I stumbled on this mother load of money related nuttiness more or less by accident. One day in June I needed something to write about and came across a recent court case that had been lost by an absurdly profitable company with a big ad budget called LifeLock. I thought that might be worth a quick post so I punched out a few ‘graphs. Next thing I know, the post is being called "biased, poorly researched, and full of holes" by "an Id theft educator and recognized expert". Awesome! Clearly, I needed to know more about this fascinating topic, so I attempted to find some hard numbers about ID theft. Although I did confirm that figures cited by LifeLock in its advertising are basically fiction, I failed miserably otherwise. Depending on which government agency you ask and how you define your terms, ID theft is either the most common crime in America or hardly ever happens. When you get down to it, we know very little about ID theft. Which just makes it more scary. Kinda like global warming. But people like reading scary stories. Which brings me to the last post in this review, and one of my favorites for 2009, How to Guess a Social Security Number and Get Famous on the Internet. It’s about a pair of professors who write a clever paper on how it is surprisingly easy to guess a person’s social security number under certain circumstances. (For example, if the person is a pre-teen from Alaska.) It adds further evidence, as if we needed it, that knowledge of a SSN is not an adequate proof of identity. Everybody seems to know this, but nobody seems interested in doing anything about it. More fun to be scared. Tomorrow, theme #3: we’re all idiots. Heh, we all know it’s simple fraud. But technology just allows those who perpetrate it to do be able to do it on a larger scale, to automate tedious tasks, with less physical risk to themselves. Note the recent Citibank heist where a gang hauled out a few million dollars (http://online.wsj.com/article/SB126145280820801177.html). Now that’s a lot safer for the bank robber than walking into an actual branch and doing it the old fashioned way. Since the average journalist’s grasp of technology is about as good as their grasp of personal finance, “ID theft” is this scary intersection of two topics they haven’t the foggiest clue about. Plus it has a catchy name. “Fraud” is so old fashioned, like newspapers. Frank, I’ve read many of your posts this year about debit cards. I use a debit card, but my reasons fall outside your stated realm of comprehension (the three reasons you listed in your September post). Allow me to explain. I’m not a credit risk. My bank even trusts me to hold one of their credit cards. Two, actually, but I rarely use them. I don’t object to them on ethical or moral grounds, and I don’t have a deep-seated psychosis that would cause me to max them out if they ever escaped my wallet. They’re simply useless to me. I see the allure of “borrowing other people’s money”, as you do when you buy something on credit and then pay the bill a few weeks later. However I don’t see where this has any practical benefit. Imagine I charge my $5 latte. I paid for it with my bank’s money, which leaves my $5 free until the bill comes. Awesome. Now what, exactly, do I do with it? I can’t spend it, because I need it to pay the bill soon. I could try to save it and earn interest, but my options are limited to short-term, risk-free accounts that nowadays earn “at most” 2%. (If you know of a short-term, risk-free investment yielding 10%, I’m all ears.) That’s $1.66/mo on $1000, which is more than I’m likely to charge in a month. In return for my $1.66/mo, I take on the risk of the bill somehow not being paid on time, through my own mistake (fat fingers on my online banking site, or forgetting because I have more important things to ponder than the latte I bought three weeks ago), or by the credit card company’s chicanery (processing delays, or moving the billing cycle up/back a few days). One month’s interest at 15% wipes out my year’s gains at 1%. I could set up a system for auto-payments, or e-reminders, or write it on my calendar so I don’t forget, or pay it off a week sooner than I’m told to, but… why? 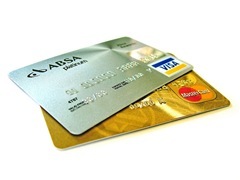 Isn’t it simpler to have my own money available to me on a debit card? I can earn money at my job, and then spend it with this magic card, in real life or online, without lugging around cash and coins (which you don’t like, either, and I don’t blame you). I can use it at Costco, or at places that have minimums for credit cards, and it doubles as an ATM card if I want some green paper to carry around. It looks just like a credit card, too, which means people will think I’m either a normal free-spending Joe Sixpack, or I walk among the financial elite, those who have mastered the art of high-risk, low-reward cash arbitrage. If some disaster causes me to need access to borrowed money on a credit card, I can pull the ‘other’ magic card from my wallet. But I rarely do, so it just collects lint. I must be nuts. Please enlighten me, Frank, so I can stop dragging my knuckles behind me as I walk. After reading the “magic fairy land of identity theft” line I feel compelled to purchase Frank an alcoholic beverage of his choice. Your blog is pretty cool to me and your topics are very relevant. I was browsing around and came across something you might find interesting. I was guilty of 3 of them with my sites. “99% of blog owners are committing these five errors”. http://is.gd/gP5kZM You will be suprised how fast they are to fix.